What is WAFM and how does it bring equity to the process for funding California’s trial courts? What does WAFM stand for? WAFM stands for Workload-Based Allocation and Funding Methodology (WAFM). The Judicial Council uses WAFM to calculate how much funding each of the state’s 58 trial courts will receive annually, based on the workload at each court. What determines how much a court receives? Under WAFM, funding is based on a court’s workload—not just the number of cases received but also the types of cases handled annually. A traffic infraction, for example, takes far fewer resources and staff than a complex felony, and is given less weight in the calculation. Court filings are averaged over a three-year period to avoid funding swings that might come with a surge or decline in filings. There is also a minimum level below which a court’s funding cannot fall—for the states smallest courts with as few as two judges, that’s $750,000. The council uses statistics from the U.S. Bureau of Labor to factor in the differences among courts in costs of employee salaries. Do courts get all of their money this way? No. While the majority of a court’s budget is determined this way, many programs within the courts have their own separate funding sources. Programs that are not dependent on WAFM funding include dependency counsel, court security, and interpreters, among others. While the Judicial Council calculates a trial court’s budget allocation via WAFM, each court gets to decide how to spend that money. Why did we need this new formula in the first place? 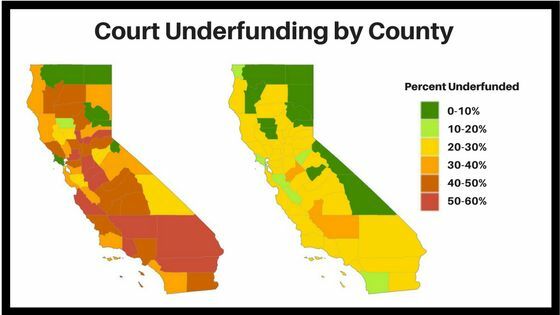 Trial court funding was once a county responsibility, which led to wide funding disparities depending upon how each of California's 58 counties chose to fund their courts. When the state took over trial court funding in 1997, money was first divvied up based on how each county had historically funded its trial court. So trial courts in richer, more populous counties continued to be well-funded while courts in poorer areas had as little as 40 percent of their budget need met, even as court filings in some of those same areas rose dramatically. The judicial branch created the current funding formula to bring equity to the system. The branch assumed it would continue to get new money from the state—easing burdens on the most underfunded courts and causing little disruption in the better-funded courts. Unfortunately, chronic underfunding of the entire trial court system continues. Before the judicial branch implemented the Workload-based Allocation and Funding Methodology (fiscal year 2013-14) (left) some trial courts were underfunded by as much as 60%. In just four years (fiscal year 2017-18) (right), the new formula had helped equalize funding gaps. In 2012, the Chief Justice and the Governor created the Trial Court Funding Workgroup, an inter-branch group that conducted a comprehensive evaluation of the state’s progress in achieving the goals outlined in the Lockyer-Isenberg Trial Court Funding Act of 1997. That legislation provided the state assume primary responsibility for funding trial court operations. One of the workgroup’s recommendations in its final report was to develop a funding approach that would result in a fairer distribution of funds among the trial courts. Building upon that recommendation, the Judicial Council’s Trial Court Budget Working Group formed a sub-committee that included 7 presiding judges and 9 court executive officers from counties of varying size, location and funding need. The sub-committee met over the course of five months, and in April 2013, the Judicial Council approved its recommendation to create WAFM. Under the WAFM model, courts in larger, better-funded counties—or “contributing” courts—lost portions of their budgets to counties that had long been underfunded. Depending on changes in workload, a court can be a “contributing” court one year and a “receiving” court the next, earning extra funds as needs for services increase. Why build in a transition period? The working group of judges and court executive officers who created the formula believed courts would need time to adjust—not just to less funding, but also to more funding to make sure the new money would be used efficiently and effectively. The council established a transition period to avoid unmanageable shifts in funding. The goal was that each fiscal year, WAFM determine a larger percentage of a court’s allocation, with the rest based on how a court was historically funded by its county. At its Jan. 12 meeting, the council approved using WAFM to determine 100% of the funding amount for each trial court. Will there be changes made to the model? The judicial branch is constantly reviewing the WAFM model. The council created a process that allows courts to ask for changes to the formula. For example, the council can adjust the weights given to each type of case that determines a court’s workload, as new state policies change how the courts do business. Proposition 47, for example, increased workload for court staff and made some felony and misdemeanor case types more complex and time-intensive. While the model has helped equalize funding gaps across counties, chronic underfunding of the judicial branch continues to complicate its implementation. The judicial branch often receives no new funding from the state, so extra money for courts facing increased demand for services has come at a cost to others.